And just like that, all is right in the Hawks world. For those among us obsessed with the 60 minute effort, you could make a case that tonight was your night. The Hawks, without their most dynamic offensive player, fired 40 shots on net against the team with the best shot suppression in the league. 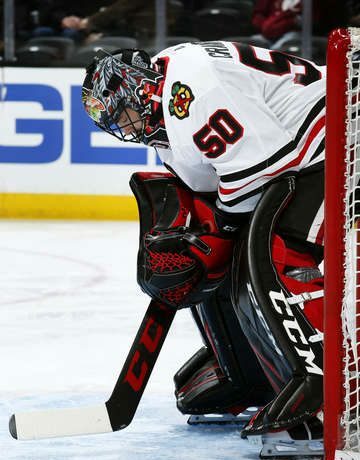 The Hawks never trailed in this one and if it weren’t for a pretty awful goal let in by LEMONT NATIVE Scott Darling, he could have had back to back shutouts. –If the Kings do manage to make the playoffs (which they most assuredly will), at least the Hawks can say they did everything to keep them out. I was thinking about the Bears/Packers from a couple years ago for whatever reason tonight. Not that cross-sport comparisons is something I’m big on, but it was still a similar situation. This time at least, the Hawks put the Kings a foot closer to the chopping block. The Hawks had a stranglehold on this one from pretty much the first shift when Patrick Sharp sprung Antoine Vermette on a semi odd-man rush. Even with the Hawks cranking up the hitting for the meatball contingent in the second period, the Kings still only half-heartedly responded. The big difference was the Hawk forwards had a ton of jump through the defensive and neutral zone. So plodders like Robyn Regehr were getting torched and leading to various odd man rushes early on. Also, Oduya and Hjalmarsson have returned to Swedish deity status. –Speaking of Regehr, if this was the version during last summer’s 7 game series, things may have turned out a little differently. He was a step slow all night and getting matched up against Shaw, Saad and Bickell didn’t help matters. 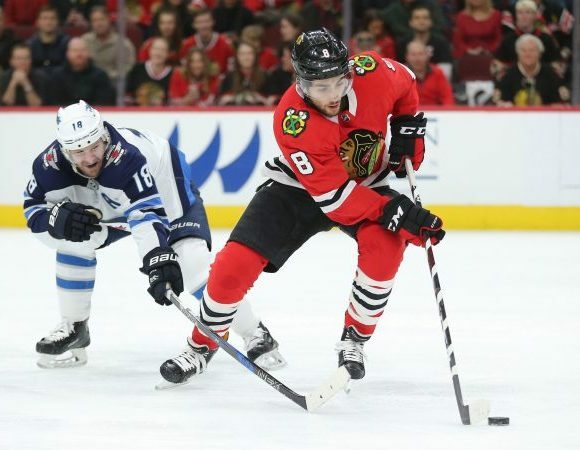 –There’s something about the Kings that brings out the best in Brandon Saad. In the first period, he took the puck in the neutral zone and blew past Regehr to lead a 2-on-1. It was an eerily similar play to the first minute of overtime of Game 7 when he left a trail of scorched earth only to blow a tire right as he shot on Quick. Of course later, he almost died on the ice when he got pancaked by Drew Doughty and Kyle Clifford but much like Andrew Shaw, I don’t think there’s much to bruise up there. –So apparently there was a rumor Kyle Baun was going to take Teuvo’s spot in the lineup tonight. I have no idea the validity of that rumor. It seems a little far-fetched especially with a game against Buffalo looming. Nevertheless, Teuvo made two plays that were out of this world special. The first, obviously his breakaway. Technically, he was not open. The Kings had sticks in the passing lane so any attempt from Keith that was near or around the ice would have gotten picked off. The only thing he could do is fire a half slap shot towards Teuvo. Teuvo picked the pass out of mid-air, dropped it to his feet and was off on a breakaway. I have no idea how many people in the world could have made this play. A rough estimate would be somewhere between Pavel Datsyuk, Patrick Kane, some bloke in the KHL and now Teuvo. The skill level on this play was face-melting. Quick made the save on the breakaway but that still shouldn’t take away what happened previously. The second was a play he made late in the second period. Holding the puck at the point and with traffic in front of the net but a teammate standing at the post, Teuvo attempted an alley oop play. It didn’t work but, as McClure said, the thought process (D.J.) is what is most encouraging. In fact, the only other player in the NHL I can recall even attempting that sort of play was Wayne Gretzky and he used to try it from behind the net to get the puck to his linemate in the slot. –Jonathan Quick has played a ton of games this year. He’s been a puddle in the playoffs before after playing that much. We’ll see what happens this year. 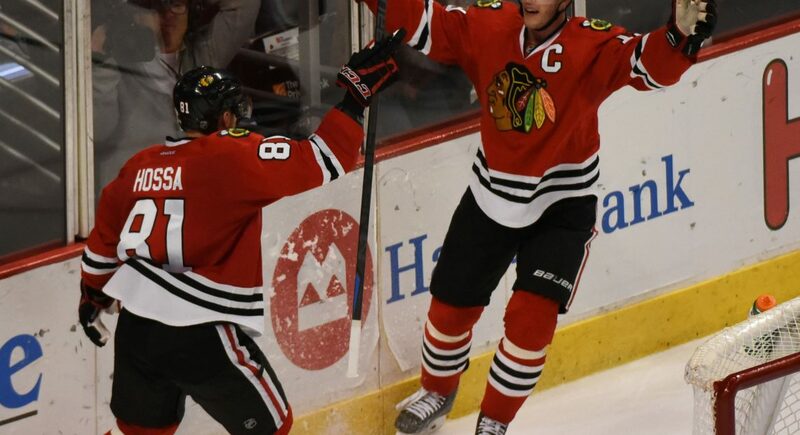 –With a Blues regulation loss and the Hawks regulation win, the Hawks sit one point back of them. Perhaps just as large, the Hawks and Blues now have the same amount of regulation wins. The division is still in sights at 4 points back, I suppose, with a game at hand on the Predators if you’re into that sort of thing. The Wild are three points back with the same amount of games left and 40 regulation wins to the Hawks 37. We’ll see how she turns.